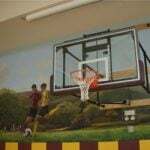 Working with any budget and requirements, we can design, supply and install modern, innovative competition standard basketball structures into any building. Whether it’s an International stadium, Council or community sports hall, school sports stadium, multi-purpose sports hall, or an undercover sports area, we have the right system for you. We have systems coming down from the roof, mounted off the wall, portable systems and in-ground systems. We offer two variants in each range, the Stadia which is the best and has the highest certification. Often has features like glass backboards, Posilock spring rings/goals, backboard padding as standard as well as engineered for maximum rigidity. Recommended for regional competition venues, secondary schools, council/community sport centres, and any facility looking for quality level of fit or require that competition standard or feel. 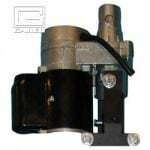 The Essential products have been slightly modified to allow for greater economy in freight and fabrication thus utilising common economical parts. Most of our indoor systems are FIBA CERTIFIED which means they are competition ready and we have the FIBA certificate available. Basketball Australia has adopted the FIBA rules and requirements so therefore we have as well. FIBA (Fédération Internationale de Basketball) is the governing body for international basketball. This Certification ensures all international basketball equipment pass a rigorous checklist of criteria and safety before gaining FIBA certification. We only offer the original, best and proven basketball systems. FIBA International Level 2 Certified and manufactured by FIBA partner Gared Sports. Custom made for every building with several configurations to suit specific building or other sports requirements. Mounted onto rigid perpendicular pre-installed UB structural support beams or possibly with engineering approvals, other non-structural members. Can be designed to retract/fold forwards, rearwards, sideways or with the benefit of a bent mast to clear other obstacles or sports clearance heights. Includes key operated safety switch electric winch, armour glass backboard (with lifetime warranty), Positive lock goal (with option of a 180-degree goal) and various coloured backboard padding as standard so fully equipped for the most demanding competitions. 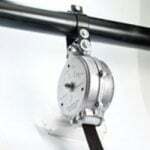 Direct mount goal and off set mast lock for maximum strength and rigidity. ·This is the most popular system for schools and stadiums where they require the best and affordable. Available as an optional extra is the Stadia AAG Height adjustable backboard system to easily change goal height from seniors to juniors or anywhere in between. A key operated electric drive option available to mechanically lift the backboard height. Also available is the recommended safety straps. When used with our scoreboards, LED backboard lights can be added, which look great and feel when used. Tested and Certified to Queensland State Schools and Colleges specifications. Economic version of the BBSTR FIBA certified structure and manufactured by FIBA partner Gared Sports. 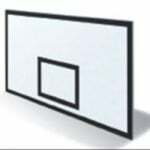 High tensile moulded 50mm ribbed fibreglass backboard for consistent ball bounce. 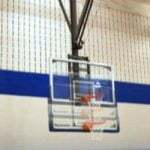 Direct mount rim with fixed goal. Available off the shelf, always in stock to be mounted onto rigid perpendicular pre-installed UB structural support beams and to a mounting height up to 9m. Can be supplied to retract/fold forwards, rearwards, or sideways. Available as an optional extra is the Essential AAG height adjustable backboard system to easily change goal height from seniors to juniors or anywhere in between. Systems are only available in a matt black colour. Ideal for either the main court or half courts running across the main court. Projections vary from 1.8m to 3.6m and even up to 4.5m on the Stadia model only but generally not recommend past 3.6m as more suited to roof mounted models then. 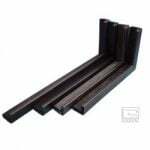 Attach to horizontal structural SHS beams or with engineer approved tilt panel or core filled block walls. Directly mounted in the play position by a locking arm. Innovative design so can fold flat against wall, no twisting or leaning out. Can swing to either side and determined during installation. Minimum of six attachment points so there is no bounce or shake in this system which is common on four point systems. For projections over 3.6m, the attachments points increase to 8 for maximum rigidity and minimal backboard reverberation. The arms are also all connected via steel braces to ensure they are strong and integral at all times. 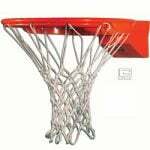 FIBA International Level 2 or 3 certified and manufactured by FIBA certified partner Gared Sports. Includes Armour glass backboard (with lifetime warranty), Positive Lock Goal (with option of a 180-degree goal) and various coloured backboard padding as standard so fully equipped for the most demanding competitions. This is the most popular system for schools and stadiums where they require the best and affordable. Available as an optional extra is the Stadia AAG Height adjustable backboard system to easily change goal height from seniors to juniors or anywhere in between. A key operated electric drive option available to mechanically lift the backboard height. 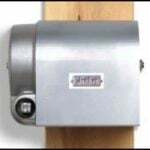 Also available is an electric key operated actuator to mechanically swing the backstop in and out. When used with our scoreboards, LED backboard lights can be added, which look great and feel when used. 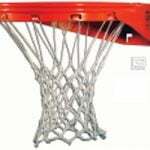 Economic version of the BBSTW FIBA certified structure and manufactured by FIBA certified partner Gared Sports. Suited to projections of 1.8m – 3.6m off the wall. Available off the shelf, always in stock to be mounted onto rigid pre-installed structural support beams or approved wall. Certified to Australian Standards and Designs by an Australian Engineer and RPEQ. Basketball’s International governing body, FIBA (Fédération Internationale de Basket-ball) for top Level Two and Level Three competition and safety to their standards. Tested and certified to Education QLD DETE Basketball Specifications and approved by a RPEQ. The systems have been Prototype Cyclic and Load Tested, as well as full Particle Magnetic Weld test, all by an independent international laboratory and overseen by QLD finest RPEQ. Shooting stations are ideal for multi-use courts when the main structures are retracted or for half court and across court games. Ideal for schools with limited space. Our innovative column mount backstops simple fit to any steel column and are compatible with our AAG’s or can be fitted at any height. For more information click here. Although manual handle is supplied as standard, an electric motor upgrade is available either key operation, remote controller or via the touch pad. Portable Basketball Systems which wheel out of storage in the folded position, connects to the floor via lock down devices, then extend into the play positions. We have portable systems for International FIBA Level I or FIBA Level 3 games and have a range to suit the venue and budget right down to other smaller portable systems for practice or recreational use. Height adjustable options available and all systems have padding also available. When only the best will do. 3.25m projection for Level 1 (Olympic and World Championship tournaments, NBL matches) or 2.45m projection for Level 3 competition are available in a range of different designs and models from around the world. HiTech Sports recommends spring assisted systems which are more economical and lower maintenance than hydraulic designs. The units come complete with high level goals, backboard, structure pads and hold downs suitable for the specific floor system. We also have the 3.25m self-weighted system that does not require lockdowns. We have a range of different systems to suit specific requirements so please contact us to discuss your exact configuration and we will happily go through the options with you as there are many variables to consider such as weight on your floor. 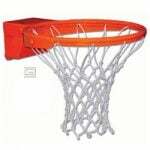 Backstops are available in a range of powder coated colours as required and are manufactured by the leading FIBA certified partners Gared Sports and the FIBA preferred supplier Schelde Sports for the Rio Olympics and the World Championships. HiTech Sports has supplied to several locations such as Townsville Entertainment Centre for the Townsville Crocs, WAIS for the athletes to train before heading off to Rio Olympics and Gold Coast 2018 Commonwealth Games. 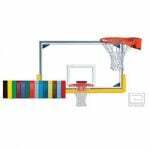 Portable basketball systems are becoming more popular especially when the court is not shared with netball. Based on international level systems, these smaller units are more compact and can have shorter projections, smaller backboards and lighter. Ideally suited for shooting stations, and lower level school or community use. HiTech Sports can offer a range of portable backstops that can easily be folded down and transported around for 3x3 competitions. Most are self-weighted. Please contact us to discuss your requirements further. BB-EWN Electric winch for Essentials systems with auto reverse safety operation. 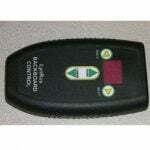 BBES-EWR Remote control upgrade for electric winch – Essentials systems. With the correct wiring, both remote and key switch can be used. Must be ordered at the same time as the basketball systems. 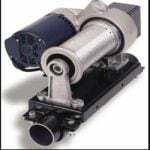 BB-MW Manual winch for Essentials systems. 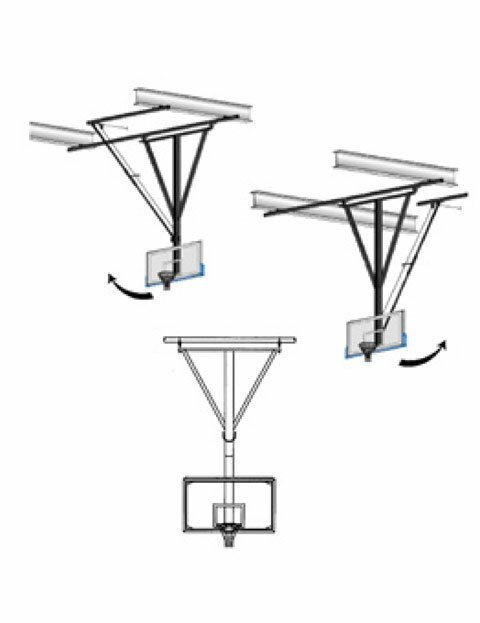 BBESAAG-W Height adjustor for Essentials Basketball systems for roof or wall mounted systems. BBESAAG Electric 220v linear motor with limit switches and switching gear height adjustor for Essentials Basketball roof mounted systems. Must be ordered at the same time as basketball systems. BBESAAGREM Electric 220v linear motor with limit switches and switching gear for a wall mounted basketball sidefold system. By turning a key the backstop will fold out or back to the wall by key switch. Must be ordered at the same time as basketball systems. 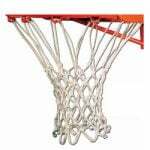 BBSS Safety strap for basketball systems – excludes fittings. BBG2 Heavy metal basketball goal. BBSG1 Essentials spring loaded ring. 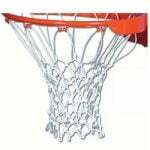 BBSG-2500i Posilock goal – FIBA certified when on approved structure. 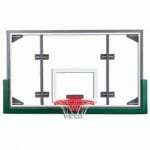 BBSG-4000i 180 degree Posilock goal – FIBA certified when on approved structure. 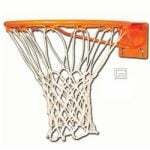 BBN Heavy duty basketball goal net – white. 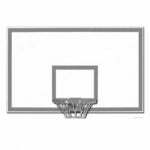 BBN-AW Anti whip basketball goal net – white. BBARG Essentials backboard. Transparent system with full metal frame, suits BBSG1 goals. Must be ordered at the same time as basketball systems. BBESPAD Essentials backboard pad. Suits 1800mm wide backboards. Black. BBSTPAD Stadia backboard padding. 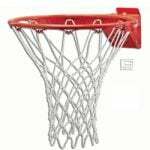 Suits 1828mm/72” backboards – nominate colour. 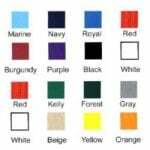 COLOUR Choice of colours available for the vinyl and mesh.